Robert Seymour cartoon, ‘King’s College versus London University, or Which is the Weightiest’, 1828. Published this month Victorian Bloomsbury is the first account of Bloomsbury’s evolution as the undisputed intellectual quarter of London during the nineteenth century. Here Ashton explains why this beautiful area of London became the intellectual heart of the city well before the heyday of the ‘Bloomsbury Group’. It is my good fortune to work in Bloomsbury, teaching nineteenth-century English literature at University College London, and to have available to me the unparalleled resources of Bloomsbury’s libraries. Here I have researched critical biographies of writers, including George Eliot and Thomas Carlyle, and studies in intellectual and cultural history. My latest subject, Victorian Bloomsbury, seemed a natural next step. 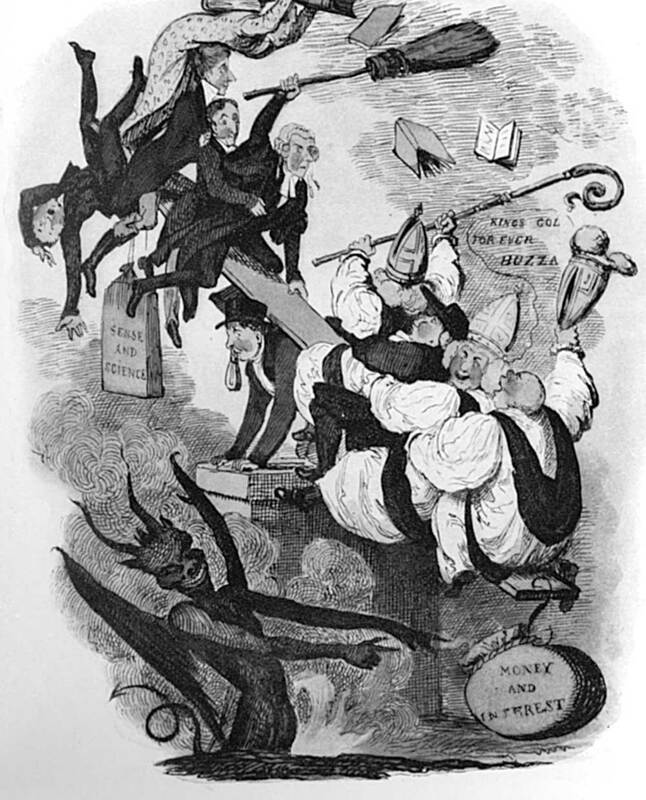 The subjects of my previous books were all progressive, be it in literary achievement, politics, social and educational ideals, religion – in short, in the particular contribution they made to British culture, or the ‘march of mind’, as a popular phrase in nineteenth-century newspapers described the phenomenon. Nowhere did the march of mind proceed more determinedly than in nineteenth-century Bloomsbury. What, then, was Bloomsbury like in the nineteenth century? The word ‘Bloomsbury’ has been used for a century as shorthand for the group of avant garde writers and artists – Virginia Woolf and her sister Vanessa Bell, the artist Duncan Grant, the economist John Maynard Keynes – who lived in the leafy squares of London WC1 early in the twentieth century. But I knew, from walking the streets and looking at the buildings, and from delving into the history of my own institution, UCL, that the crucial period of progress had been the nineteenth century, when the area developed both physically, its elegant squares and streets dating mainly from the years following 1800, and in spirit. It was in the period 1800-1900 that the area became the intellectual and cultural heart of London, the place where pioneering individuals and groups put their ideals into practice, and where many an observant and influential writer and artist lived and worked. Some of the period’s best known writers – Dickens, Thackeray, Trollope, Disraeli, Gissing, J.M. Barrie – lived in Bloomsbury; all featured the area imaginatively in their fiction. Thackeray in particular gives a startlingly accurate socio-geographical account of life in and around Russell Square in Vanity Fair, published in 1848 but set thirty years earlier. His middle-class lawyers and upwardly mobile merchants mirror the social life of the real Russell Square, Bloomsbury’s ‘top’ square, built from 1800 to 1805. 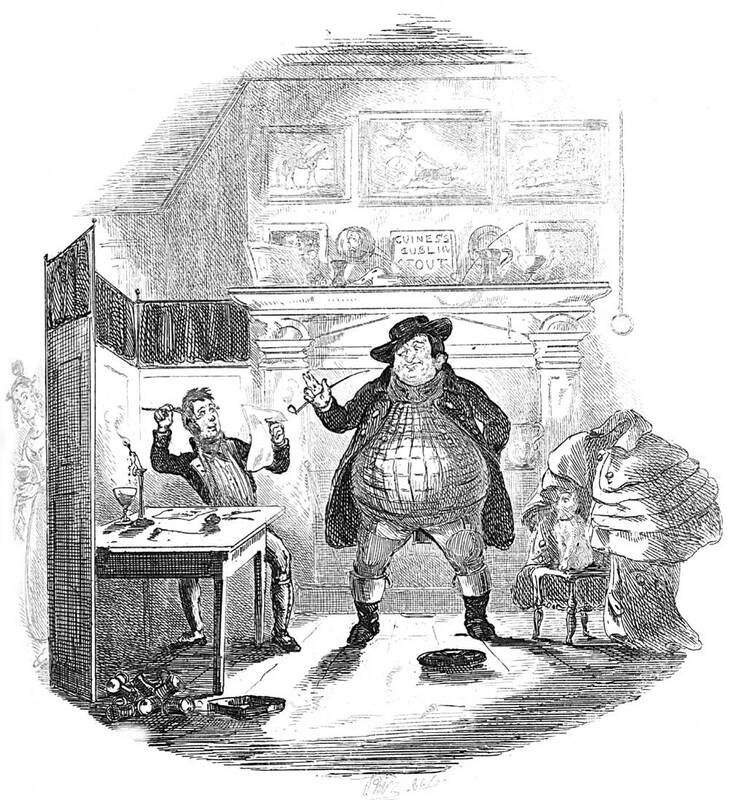 ‘The Valentine’, illustration to Chapter 33 of Dickens’s Pickwick Papers (1836–7) by Hablot Knight Browne (‘Phiz’), in which Mr Pickwick’s faithful servant Sam Weller struggles to write and is asked by his father if he is engaged in the ‘pursuit of knowledge under difficulties’ in an echo of the title of the most popular educational treatise published by Bloomsbury’s Society for the Diffusion of Useful Knowledge. Artists associated with the area ranged from the Pre-Raphaelites, who met in a house in Gower Street in 1848, and William Morris, founder of the famous decorating firm, to the great architect Norman Shaw, who worked from a house in Bloomsbury Square, and two of his young admirers, Smith and Brewer, designers in the 1890s of an acclaimed Arts and Crafts building in Tavistock Place intended to meet the needs of poor and disabled children. Many a fine new building was erected for some progressive purpose, the first being University College itself, which opened in Gower Street in 1828 to offer university education to non-Anglicans – Protestant dissenters, Catholics, Jews, and non-believers – and to embrace modern languages and various emerging branches of science and medicine, subjects not available at the two long-established English universities, Oxford and Cambridge. Its elegant neo-classical design by William Wilkins seemed to some Tory politicians and high Anglicans to represent all too visually the ‘godlessness’ and radicalism of the new university’s founding principles. But single-handedly the institution changed the character of Bloomsbury and determined the direction of higher education in the country at large. My purpose in writing Victorian Bloomsbury was to tell the story of the march of mind. Exploiting material in the archives of Bloomsbury’s many libraries, I aimed to unearth the motivations, the struggles against orthodox opposition, and the individual stories associated with pioneering efforts in higher education, medicine (the first use of anaesthetics in surgery in University College Hospital, the founding of the Hospital for Sick Children in Great Ormond Street), art (the Female School of Art, the co-educational Slade School), education for the working class (the Working Men’s and Working Women’s Colleges), for women, and for children (the first kindergarten in Britain, started by a pair of German political exiles in Tavistock Place). One of the most far-reaching achievements was the founding in 1849 of the first institution for women’s higher education, the Ladies’ College. Pleasingly, the house taken for this purpose was next door to the present premises of Yale University Press in Bedford Square. Among the earliest students were George Eliot (Marian Evans, as she was in 1850, some years before she found fame) and Dickens’s daughter Katey, who came to classes from the family home in nearby Tavistock Square. I recognise how fortunate I am to spend my days researching and writing in this vibrant part of London, so full of living history, and to be able to walk in five minutes from my place of work in Gower Street to the building in Bedford Square which houses the publisher of this book in which I have tried to capture something of that living history. Rosemary Ashton is professor of English language and literature at University College London and the author of many distinguished biographies and cultural histories of the nineteenth century including George Eliot and 142 Strand. Victorian Bloomsbury is available now from Yale University Press.